Turbo-BrainVoyager is "bootstrapped" with a MasterTBV file, which must be located in the same directory as the Turbo-BrainVoyager executable. The master file contains a few global display settings and it points to the last TBV settings file used.The MasterTBV file is automatically updated when closing Turbo-BrainVoyager. Individual settings can be edited directly in the text file or, more conveniently, using the MasterTBV File dialog, which can be invoked using the Edit MasterTBV File entry in the File menu. The program looks for a TBV settings file, which provides detailed information about a particular run in a particular scanning session. A TBV settings file (or "TBV file" for short) can be generated using the TBV Settings dialog, by editing the file directly or by using custom code to generate it automatically. Turbo-BrainVoyager constantly "watches" the folder specified in the TBV directory (called TBVSettingsDirectory in the file) to see whether a valid TBV file is available. 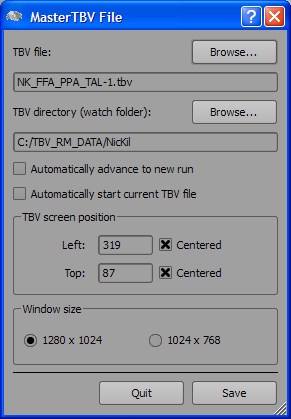 This watch folder can be changed in the dialog by using the Browse button next to the TBV directory (watch folder) text or by editing the file directly. You may also directly specify a TBV settings file by using the Browse button next to the TBV file text. The name of the specified TBV file may represent a pattern of file names the program is looking for. The file extension of a TBV file must be ".tbv". The file name is arbitrary but it is recommended to let it end with a (run) number preceded by a minus sign according to the scheme: "<name>-<nr>". In the example shown above, <name> corresponds to "NK_FFA_PPA_TAL" and <nr> corresponds to "1". Turbo-BrainVoyager watches the TBV directory for all TBV files with the specified <name> part and any positive integral number <n>. This number is also called the "run number" and allows to browse and view already recorded data. In a typical scenario, an experimental session consists of several runs, which can be inspected after recording using the Forward and Backward main control buttons. If a new run is recorded, e.g. run 2, the respective TBV file (e.g. "<name>-2.tbv") should be located in the same folder. With a click of the Forward button, this file would become the new current settings file. The program checks whether a run has been already analyzed by looking for a saved FMR project file. If such a file is available for a specific TBV settings file, the data is simply reloaded after clicking the Forward or Backward button including reloading of statistical maps and regions-of-interest definitions. If a FMR file with the name provided in the TBV settings file is not found, the program switches in real-time mode looking for incoming data to be processed. The two options Left and Top in the TBV screen position field can be used to position the program window at a certain fixed offset with respect to the left upper screen position. In the text file, these two options correspond to the entries HorizontalWindowPosition and VerticalWindowPosition. Using the Centered option (recommended) instead of fixed values will automatically center the program window on the screen. The main window of the Mac OS X version of Turbo-BrainVoyager can be freely resized. The Windows and Linux versions, however, use two fixed screen sizes, which can be selected with the 1280 x 1024 and 1024 x 768 options in the Window size field. In the text file, these two sizes are coded in the WindowSize entry, which can be either "1" (1024 x 768 pixels) or "2" (1280 x 1024 pixels). You may also switch between the two sizes using the "Restore" icon in the right upper corner. NOTE: The program also looks for files with the ".mtbv" extension. These files specify multi-run analyses. Documentation of .mtbv files will be provided in a later release.